Figure 4.1. Major ecosystems addressed in this report, with their global areal extent (lowerpanel, Mkm2), transformed by land use in yellow, untransformed in purple, from Hassan et al. (2005), except for mediterranean-climate ecosystems, where transformation impact is from Myers et al. (2000), and total carbon stores (upperpanel, PgC) in plant biomass (green), soil (brown), yedoma/permafrost (light blue). D = deserts, G&S(tr) = tropical grasslands and savannas, G(te) = temperate grasslands, ME = mediterranean ecosystems, F(tr) = tropical forests, F(te) = temperate forests, F(b) = boreal forests, T = tundra, FW = freshwater lakes and wetlands, C = croplands, O = oceans. Data are from Sabine et al. (2004, Table 2.2, p. 23), except for carbon content of yedoma permafrost and permafrost (light blue columns, left and right, respectively, Zimov et al., 2006), ocean organic carbon content (dissolved plus particulate organic; Denman et al., 2007, Section 7.3.4.1), and ocean surface area from Hassan et al. (2005, Summary, Table C2, p. 15, inserted as a number). 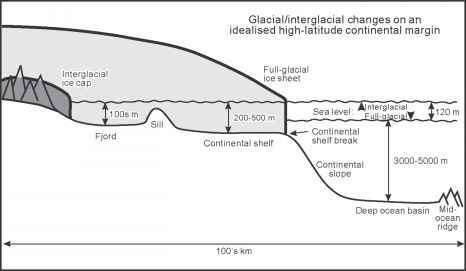 Figures here update the TAR (Prentice et al., 2001), especially through considering soil C to 3 m depth (Jobbagy and Jackson, 2000), as opposed to 1 m. Approximate carbon content of the atmosphere (PgC) is indicated by the dotted lines for last glacial maximum (LGM), pre-industrial (P-IND) and current (about 2000).